These little ghosts appeared in the yard of my neighbors, Frank and Barb. 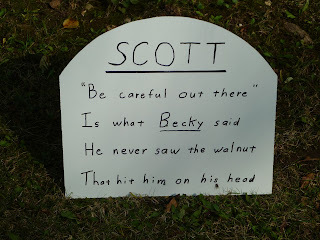 They are moving to Florida soon, and this was Frank's farewell to his neighbors and neighborhood with appropriate tombstones for several of the neighbors. Apparently Frank has too much time on his hands. Here is ours. Very apropos for all of the walnuts that we have in our yard. Thank you Frank. We will miss you and Barb. I made Scaaary Cupakes with my friend Barb and her grandchildren, a 6 year old boy and four year old twins, a boy and girl. Now these cupcakes aren't very picturesque, but they are scaaary to these children. I made Chocolate Cupcakes with Chocolate Buttercream Frosting, and also Vanilla Butter Cream Frosting and the kids frosted their own cupcakes. 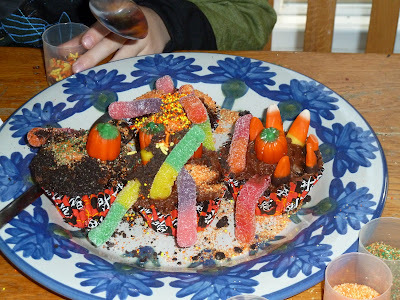 I brought candy corn and pumpkins, gummy worms, crushed chocolate cookies for dirt, and sprinkles. They had a ball decorating and eating the cupcakes. Some of the cupcakes got a generous helping sprinkles and cookie dirt, but this is what is so much fun! We were invited to our neighbor's annual Halloween Party and I wanted to make Caramel Corn. I know how addicting caramel corn can be, so I tried to lighten it up a bit, so If I ate some, the caramel corn wouldn't be so bad for me. I took the classic Caramel Corn recipe, that I have made for many years, and subbed Splenda Brown Sugar for the brown sugar, and Smart Balance, for the butter. I wasn't sure if it would turn out, but I was pleasantly surprised. I only made a half a recipe for two bags of microwave popcorn. that way I could drizzle on the caramel, and it wouldn't totally cover the whole kernels. There was just enough sweetness to know that you were eating caramel corn, but not so sweet, that your teeth hurt. After the Caramel Corn had cooled, I added in the almonds, and candy corn. If you didn't want to eat those, you could pick them out. Mix brown sugar or Splenda brown sugar,, corn syrup, butter or Smart Balance and salt in a heavy 2-quart saucepan. Stirring constantly, bring to a boil over medium heat. 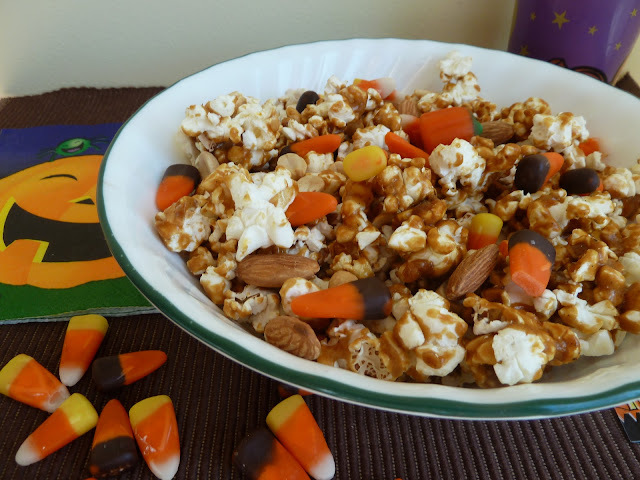 *You may add in the candy corn and almonds, or any other add ins, after the Caramel corn has cooled. 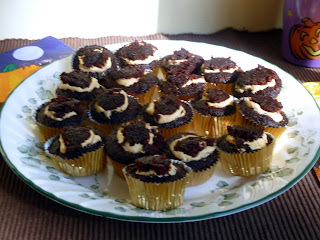 I also took the Mini Chocolate Cupcakes with Pumpkin Cream Cheese. 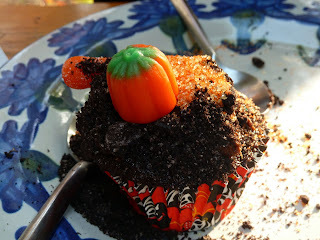 I already had some Mini chocolate cupcakes leftover from decorating Scaaary cupcakes with the kids. I cut a hole in the top of the mini cupcake about the size of a quarter, and using the cone method, I filled the cavity with the Pumpkin Cream Cheese filling, and replaced the top. Then I frosted the mini cupcakes with Vanilla and Chocolate Butter Cream, and then decorated with the candy corn and sprinkles. Combine, softened cream cheese, pumpkin puree, sugar and cinnamon. Fill mini chocolate cupcakes with the cone method. Frost and decorate as desired. 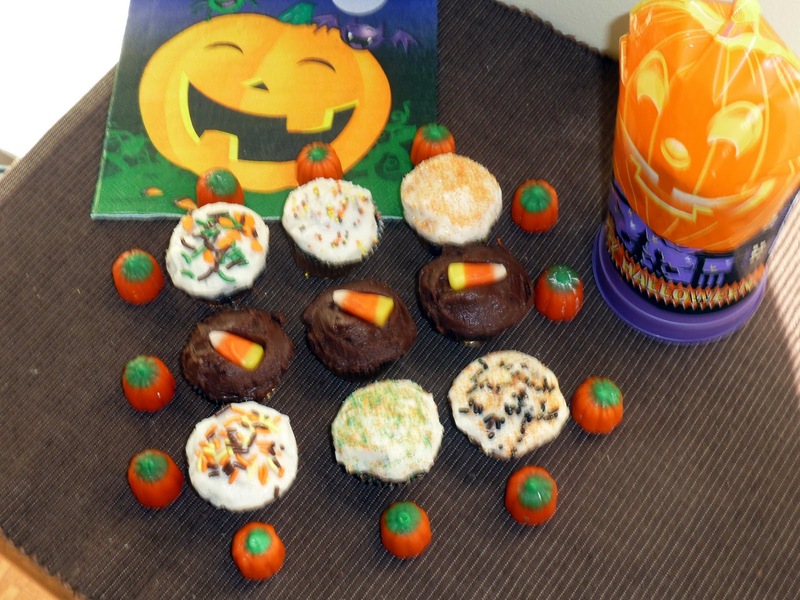 Refrigerate decorated cupcakes, until serving time.Trick or Treat!!!! Halloween is my favorite Holiday this is an awesome post! FUN!!! thank you for your sweet words. Trick or Treat! The kids did such a good job on their cupcakes! I love seeing kids have fun in the kitchen. Have a great Halloween Becky. The kids did have so much fun! Trick or treat! Oh Becky, this looks so good..I love your caramel corn, and cupcakes looks awesome too! Happy Halloween..
Sandra-Thank you for your sweet words! Happy Halloween! Becky-you're always so thoughtful about making gooies for children, other than your grandchildren, and I'm sure it's greatly appreciated. Such fun and yummy treats!!! Your friends tombstones are hilarious. Happy Halloween! My doorbell has been ringing non-stop. Love all these goodies, actually I've had a little too much candy myself, but I still have a little room for that caramel corn. You know what I just noticed, you have a link for What's for Dinner, I don't use that url anymore, just the spcookiequeen one. Probably been like that for a while and I just noticed, he he. One of my favorite times of the year for fun and you captured it here in this post love the tombstone! GREAT job Becky! Elisabeth-I am so lucky to have "shared grandchildren", because I don't get to see my Granddaughter very much, she's now a college freshman, and busy, busy, busy! Gina- We had six trick or treaters! I opened Pandora's bag of Snickers, and had a couple. I couldn't resist. The tombstones are too funny. Our neighbors are always pulling pranks on one another. Claudia-thank you for your sweet words. 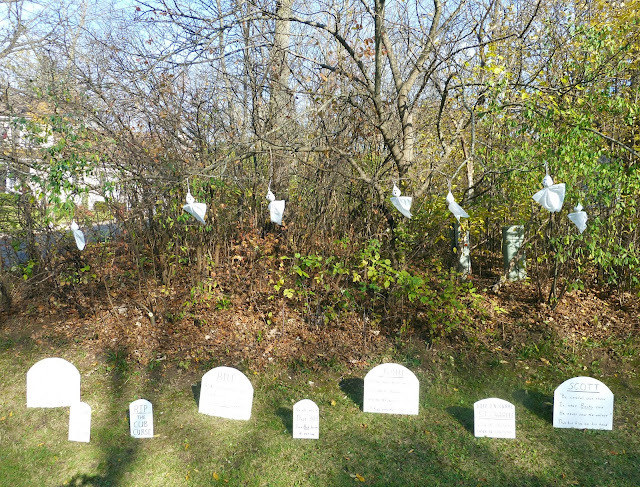 We laughed so hard, when we saw the tombstones. Oh, how yummy!!! LOVE your lightened up caramel corn...I can't stop when I start eating the stuff, so I dare not make it! But now I have a less guilty pleasure! And your filled cupcakes sound fabulous, too.